Update: The image, shared on NeoGAF, has since been believed to be fake, having been posted in a, since deleted, Chinese forum thread where users posted Nintendo NX design ideas. The image is still fuelling speculation, seeing as the same forum was previously used to accurately leak the PlayStation 4 Slim and PlayStation 4 Pro designs. 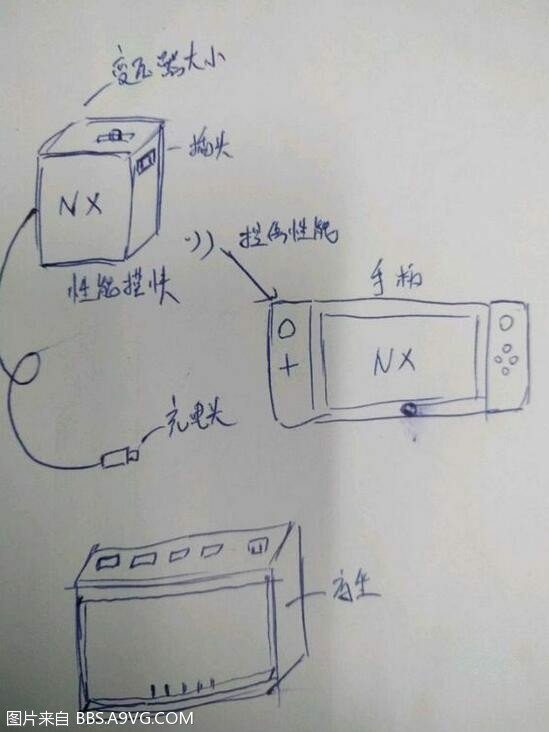 Original Story: Not long after it was reported that Foxconn Electronics has started trialling Nintendo NX production, it appears that an employee that works for the Taiwanese electronics manufacturer has sketched the separate components that make the dedicated game platform. The appearance echoes the rumours that have been reported over the past months, namely around the concept being centred upon a portable console with detachable controllers. The result is a console and handheld hybrid, which separates itself with three parts: a dock; a performance module; and a handheld. The dock reportedly contains a hard disk drive, cartridge slot, numerous interfaces, and supports TV output. Whereas the performance module is a portable device that provides a power supply, as well as containing a lithium-ion battery, CPU and GPU elements, and supports Bluetooth, Wi-Fi, and wired connections. The handheld is a 6-inch 720p screen with a low thermal design power (TDP) system on a chip (SoC), which lends enough power to perform basic operations with lower quality graphics when the performance module isn’t connected. It can provide “console-level graphics” when the performance module is connected, which is why the module is similarly portable as it has its own battery. When docked, the system will act like any other console but will allow the handheld to be designated as the primary display. Interestingly, the sketch references that there is two system on a chip candidates for the console, in either Nvidia’s Tegra chip with Pascal architecture or AMD’s Radeon R9 series. As there is now way to confirm the sketch’s legitimacy until Nintendo choose to reveal the console, we’d recommend speculating over this until we learn more concrete information. And anyone will believe that a foxconn employ can reveal NX design without the company slash their head? And also Nintendo slash the head of foxconn? Can anyone estimate the amount of money foxconn will need to pay to Nintendo after the multibilionar demand to foxconn company for reveal the most anticipated project from Nintendo company company? Really some one will think that foxconn will take this risk for nothing? What gain foxconn with betray the company that for years relied on them and miss an business for so long? I know that journalist want to said something new or attractive but please! Its not too smart from foxconn to bite the hand that give they a large history of business for nothing. From what source did you obtain this sketch? Basic rule reporting, guys. This is obviously fake. And maybe take a journalism class. For real. I wish I could block you and forbes from my google newsfeed.